The two productions of Monteverdi's L'Orfeo on the DVDs recently released by Dynamic and Opus Arte couldn't really be more different. On the Dynamic label is a production filmed at Teatro Real, Madrid, in May 2008. The music is provided by Les Arte Florissante, conducted by William Christie, and it features Dietrich Henschel in the title role. The production, directed by Pier Luigi Pizzi, sets the opera in the Mantua ducal palace where the opera was first staged, and the performers project the story with emotional, expressive performances. 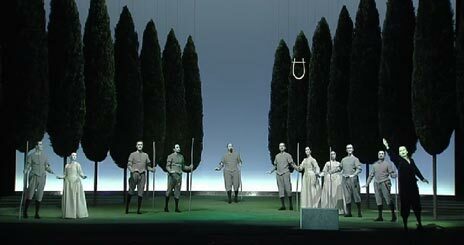 The production, directed by Robert Wilson, is said to have been inspired by a painting by Titian. For example, in the Dynamic version Orpheus and Eurydice celebrate their forthcoming marriage in Act 1 with joyful dancing and kissing, whereas in the Opus Arte version they sit next to each other and barely raise a smile! As far as the music is concerned, both sets are excellent. On the Opus Arte version Rinaldo Alessandrini's conducting is slightly faster paced, but they are equally perfect. Now let's come to the main role, Orpheus. One characteristic of Monteverdi is his use of a vocal effect known as the "bleat", in which a single note is rapidly repeated, and when performed well it can have a beautiful, emotional effect. Georg Nigl achieves this superbly, but Dietrich Henschel's Orpheus makes it more like a stutter, losing a dimension in Orpheus's performance. So in conclusion I found the Opus Arte version more satisfying. The stark production leaves more to the imagination, and allows the music to convey the emotion of the story without the distraction of the action on stage, but perhaps more importantly, Georg Nigl is a far more satisfying Orpheus. Les Arts Florissants, conducted by William Christie, 2008. Cast: Dietrich Henschel (Orfeo), Maria Grazia Schiavo (Euridice). A magical production, with sets and costumes inspired by a painting by Titian, and an excellent Orfeo. Milan La Scala Orchestra, Concerto Italiano, conducted by Rinaldo Alessandrini. Cast: Georg Nigl (Orfeo), Roberta Invernizzi (Euridice), Sara Mingardo (La Musica), Luigi De Donato (Messenger).